The Pete DiCianni Memorial Bocce League playoff tournament and 1st annual league picnic took place on Saturday, Oct. 20 at Kirkwood Park in Voorhees. The tournament started sharply at 8:30 a.m. and the final ended around the same hour in the evening. Teams “set up camp” for the day and they competed against one another for the Championship trophy. All attendees were treated to porchetta (roast pig) from Esposito’s in Philadelphia, and many teams donated sides to share such as broccoli rabe, macaroni salad and desserts. In the end, the Berlin Ball Bangers emerged victorious after an exciting match against reigning champs, La Famiglia Bocce. Similar to horseshoes, bocce is a game of skill that does not depend on age, strength, speed or agility, so much so that 8 year old children can compete with 85 year olds. The Pete DiCianni Bocce League is a non-profit organization comprised of over 120 members from across South Jersey and Philadelphia, and has enabled friendly bocce competition since 2014. The league adopted the bocce courts in Voorhees’ Kirkwood Park as its home in the spring of 2016. 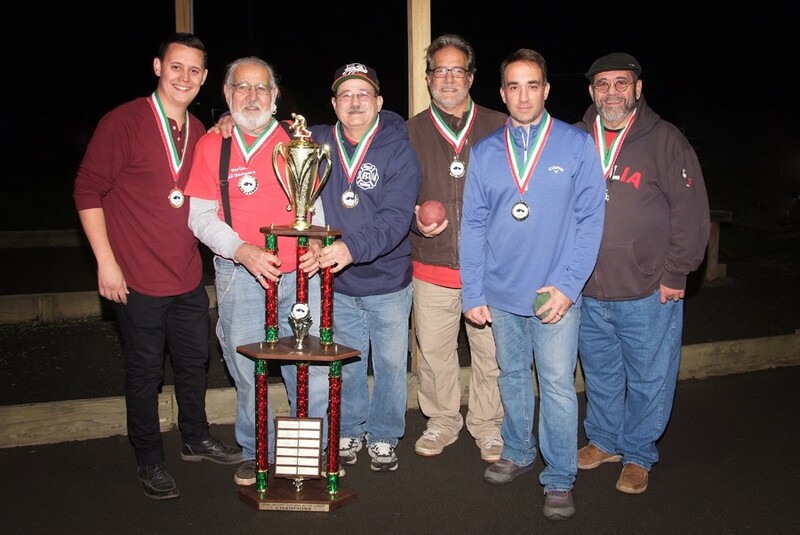 The league sends a special “Grazie Mille” to Bill Maffucci who worked together with Voorhees Township to have the bocce courts constructed years ago. This past 2018 season, the league partnered with Joe Lovallo, Director of Voorhees’ Department of Public Works, to add court lights which enabled evening play into the late summer when the days begin to get shorter. The league is actively recruiting teams for their 2019 season that will run from May to September. All games will be played at the courts in Kirkwood Park. Games are scheduled Monday through Thursday; teams play one night each week from 7 to 9 p.m. The full season schedule is distributed prior to the season’s start. Men and women (and boys and girls when accompanied by an adult) are welcome to join or field a new team. The league’s only requirements are that players abide by the league’s rules of play and that all participants conduct themselves professionally during competition. The league looks forward to welcoming new players. Learn more about the Pete DiCianni Memorial Bocce League by visiting http://www.pdcbocce.com or by sending an email to commissioner@pdcbocce.com. Teams are already forming from across South Jersey in preparation of the 2019 season.